Streetwise Professor » He’s Baaaacccckkkk! Dmitri Medvedev announced today his support for Putin’s return to the presidency in 2012. According to the NYT story, Medvedev made the announcement in a voice cracking with emotion. His statement touched off uproarious applause: this seems like something out of a Communist Party Congress of Soviet days. Forcing Medvedev to make the announcement, standing alone before the United Russia party members, was the ultimate humiliation to this rather pathetic figure. It completes his slow-motion emasculation, and although the process has gone so far it would seem to require microsurgery to finish the job, Putin did it with a figurative chainsaw–just so no one could miss the point. I admit that I was surprised–wrong–that Putin did not attempt some constitutional judo to remain in the presidency in 2008. So why the change in 2011? The answer to the question is overdetermined. Numerous factors all push in the same direction. First is Putin’s narcissism and love for power. I don’t put too much weight on this factor as even as mere Prime Minister he has remained the dominant force in Russian politics, and has been able to work non-stop at building an ego building cult of personality. Second, there is no constitutional obstacle this time around. Legitimacy is important, and although the issue could have been finessed in 2008, doing so would have compromised his legitimacy and left him open to challenge on constitutional grounds. He squared the circle by appointing a cipher to succeed him, all the while retaining an iron grip on the true sources of power in Russia (even though these are formally in the remit of the president). Third, Russia felt itself to be flying high in 2007-2008. Oil prices were soaring. Growth was robust. The US was reeling from its engagements in Iraq and Afghanistan. There were no readily apparent threats to stability. A relaxation of the system of unitary control seemed safe. But everything changed almost exactly 3 years ago, mere months after Medvedev’s election, with the financial crisis in the West. Although Putin at first boldly stated that Russia would weather the storm with no difficulty, that turned out to be a wildly inaccurate prediction. The crisis hit Russia harder than any major country, and shook the country’s economic and political system to the core. The seemingly inexorable rise of the country proved chimerical: collapse and chaos were serious possibilities. Although Russia and Putinism survived the crisis, the country–and Putin–were shaken by the experience. Listen to Putin’s rants against the West generally, and America in particular. They reveal a control freak who rages against the fact that there are existential things outside of his control. The country emerged from the crisis–the first crisis–shaken and weakened. The crisis undermined the flow of rents that keep the natural state together. Although growth has returned, it is not nearly as strong as in 2006-2007, and is unlikely to reach those levels any time soon. Thus, whereas Putin probably calculated that circumstances were so favorable in 2007 that the country’s political and economic system could withstand a division of the power vertical, his calculations are doubtless far different now. A near death experience has a way of concentrating the mind. The heady visions of 2007 have proved illusory. And importantly, another crisis looms, a crisis could actually be more shattering than the last. In brief, it is likely that Putin believes that his system can no longer operate safely with the ambiguities and slippages and potential for conflict and division inherent in a duumvirate. Hence Medvedev’s public humiliation and Putin’s triumphant return. A final note on the implications of this for the US. It is clear that this development puts paid to Obama’s sucker bet–the “Reset.” The administration foolishly thought it could play divide and conquer, and quite transparently courted Medvedev and treated Putin with disdain. Indeed, it is hard to express just how self-evidently foolish this was, and harder still to explain how the administration could have possibly thought this would work. What happens in the coming months is highly contingent on what happens in Europe. The EU is teetering on an economic precipice, and I cannot conceive of a plausible scenario which does not involve it plunging over the edge. In that (likely, IMO) event, the consequences will be shattering worldwide, but especially so in Russia. The last crisis showed its vulnerability, and a bigger crisis closer to home will subject the system to a daunting test. The real possibility of such a crisis is exactly why I believe Putin is returning. Putnism is under threat, and Putin has concluded that it can survive only in its pure, unadulterated form. By 2024 Putin will have ruled longer than Tsar Nikolai II, longer than Brezhnev. Then, he can set his sights on the record held by his hero Stalin. The Russophiles told us this would never happen, demanded we let Putin have a fair chance to fade into history after mentoring Medvedev and then letting him build a democratic, civilized country. They asked us to drop our guard. They lied. If Russians don’t block this move as they blocked the Gorbachev putsch, they are doomed as a people, and deservedly so. Russians are truly psychotic. They consider Yeltsin horrible, yet they don’t extrapolate from that to assume that his choice of Putin must have been bad. And if Medvedev is so bad, then wasn’t Putin guilty for choosing him, and what other mistakes has Putin made? Putin is a Teflon person in Russia, immune from criticism, just like Stalin. Without criticism, Putin’s mistakes go uncorrected. ANY other prime minister with a record like Putin’s over the past four years (last four months alone stock market lost 30% of its value) would have been fired. LA RUSSOPHOBE: Kevin Rothrock of “A Good Treaty” says Putin won’t return to the presidency in 2012, Medvedev will be reelected. Do you agree? ANATOLY KARLIN: Yes, I do. If I had to bet on it, I’d give the following odds: Medvedev – 70%, Putin – 25%, Other – 5%. Ouch, so much for the “analysis” of the Russophiles. Nice job, guys. Is anybody else wondering what else the Russophiles might have been wrong about? Is anyone else wondering why the Jamestown Foundation still pays for your crap, Phobie? This would include a genuine transition to democracy and economic relations, based on private enterprise. A ten-year projected decline of the Russian population by 16.5 million to 131.5 million by the year 2005, coupled with about four hundred thousand tons of grain exported for 1996, suggests that the country finally would become able to feed itself. The military-industrial complex is closed down and the armed forces reorganized into a constabulary force, without offensive combat capabilities. After the young economist Grigory A. Yavlinsky has been elected president and proclaims a Compact with Russia, an enormous rescue operation is mobilized by the industrialized world. It dwarfs the Mexican bailout. Moscow offers as collateral its natural resources, valued at $29 trillion. The World Bank, International Monetary Fund, European Bank for Reconstruction and Development, the G-7 organization of seven leading economic powers, and (a – We especially loved this part) private banks in the West and Japan all join in support of this largest assistance program in history. The new leadership in Moscow proposes to transform the Federation of Russia, with its twenty-one republics, into a United States of Russia that would encompass forty-six territorial units. Five of the latter are Cossack republics, named after historic military settlements along the border of the former tsarist empire. A continental congress, convened at St. Petersburg, drafts a new constitution and a bill of rights. 1) Decline of Russia’s population to ~130 million. 2) Elimination of Russia’s military-industrial sector. 3) Elimination of Russian military capabilities. 4) Western control of Russia’s then-$29 trillion natural resources sector, at a price of ~$100 billion (The Mexican bailout Our good Professor Starr referred to came to about $50 billion). 5) The multiplication of territorial units in Russia, to ensure when that ramshackle country fell apart there would be as many small pieces as possible. As you can clearly see, Our hopes high hopes for Russia have been deeply, bitterly disappointed, and the agent responsible is Our rebellious servant Vladimir, whose return to power in Russia will further delay Our plans. Почему етот бог! Спаси Россию! Who will accompany Putin to the swearing in ceremony. Will it be the gymnast, the cat photographer, or will he actually be so weak as to summon his wife from the monastery. Maybe after he regains the presidency he will have pity on his friend Berlusconi and hold the next bunga bungas in the Kremlin. Putin’s weakness for women is now readily apparent and he will be a Berlusconi type laughing stock internationally. @pahoben–too funny, yet to sad at the same time. Pathetic, really. 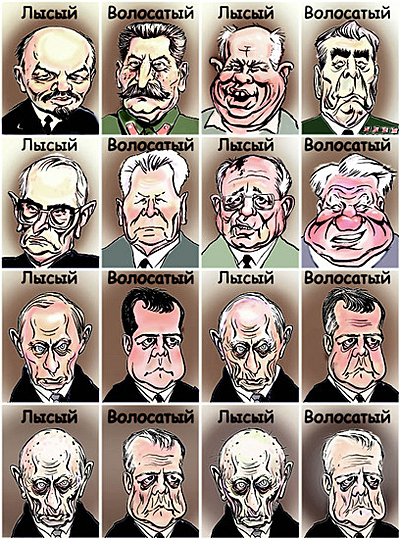 More importantly, it means the Bald-Hairy theory of Russian leaders continues to hold true. Right after Attack Watch, we have Fed watcher watch. Got a problem with Bernanke? Shut up, at least America doesn’t have that evil Putin running things! blockquote>And once the Internet is completely “transparent”, the Fed will next focus on telephone conversations, and finally will simply bug each and every otherwise “private” location in the world. Because very soon saying that “printing money is treason” will be treason, and such terrorist thoughts must be pre-crimed before they even occur. Remember, you’re on the Fedsury’s plantation now. Putin in, ruble continues to slide.